The Return of MY GREATEST ADVENTURE!!!! Wow. That was a longer break than I expected to take. I’m getting back to the swing of things and will be explaining that here, sort of, which is the real reason for my absence here. OK. How about this: I simply bit off more than I could chew. I’m pulling it all back on track now, and hope to have more for you real soon. In the meantime, maybe you’ve heard, DC has a planned relaunch in a matter of days now. 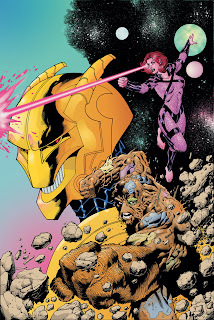 One of the eventual fruits of said relaunch is a revisitation to the title that spawned not only this blog’s title, but the book that gave us the Doom Patrol. That’s right, friends and neighbors, My Greatest Adventure returns to DC Comics’ publishing schedule. The first issue hits in October and features a story about the DC nu version of Robotman. Here’s the solicits for the October and November issues. The adventures of Garbage Man and Tanga from WEIRD WORLDS continue – and now, these offbeat heroes are joined by the Robotman, who has a disturbing knack for self-destruction! When Batman goes hunting for answers Garbage Man might be able to provide, things start to look up for the toxic man. Meanwhile, Robotman follows a zombie trail from Zanzibar to a strange island filled with even stranger creatures, and Tanga encounters an alien monster that might be too much even for her! Once again, we're treated to a book with Cliff Steele in it AND Kevin Maguire art under the same cover. I, for one, am extremely enthused about this book. 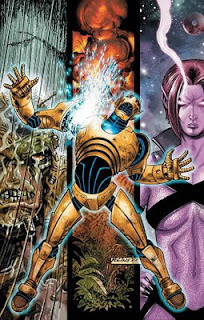 For more about the book - specifically the Robotman segment from the very mouth (or keyboard) of Matt Kindt, here’s a link to an interview with Matt Kindt on CBR. Kindt, interviewed here by Josie Campbell, will be writing the story for Scott Kolins’ pencils. That's what I've got for now, Patrollers. I'll be back soon. Promise.